These steps are critical to success and synergetic with each other. Engineers are not known for their ability to embrace change – our preference is to follow a more linear path, from beginning to completion, and with as few hiccups as possible. In the world of laboratory and manufacturing design for pharmaceutical clients, however, the ability to adapt to change is an absolute. Why? Client funding can fluctuate based on either a positive or negative clinical trial. For a publicly traded company, the failure of a clinical trial can be catastrophic to future growth and in turn may completely change or eliminate your current design. Understanding how this industry functions will assist the engineer in having the foresight to anticipate and positively adapt to potential changes. As mentioned previously, pharmaceutical companies ride a fine line of success and failure, especially start-ups looking for success with their new drug or process. With such clients, engineers need to expect the unexpected: with successful clinical trials comes increased funding, which can positively transform an entire project. Stakeholders who may have been looking to grow slowly could now want to ramp up production of a new drug, incorporating cGMP (Current Good Manufacturing Practice) into their project; or the success could dictate that a different process with different equipment be required in the same building shell. In particular, it is not uncommon for a piece of process equipment or one that requires a specialized voltage (400V) to be added to the design last minute. Equipment procurement can also differ from what was listed on the equipment schedule, therefore requiring modifications to the design during actual construction. While you cannot predict the future, knowing that things can and will change goes a long way to maintaining your sanity in a fast-track laboratory or pharmaceutical project. This all leads to one of the greatest attributes an electrical engineer can have in this realm: the ability to plan ahead. 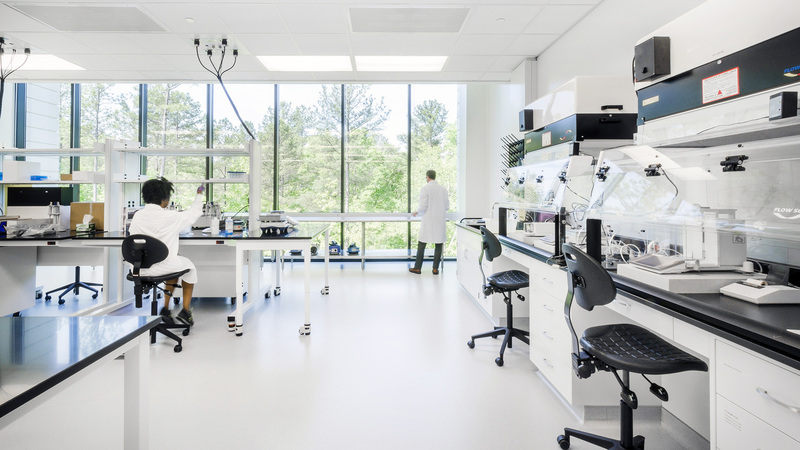 Proper planning allows for the fluctuations and deviations inherently present in pharmaceutical research and manufacturing facility design to be absorbed more easily. It is critical that early in the project, (and this is true for all projects, not just laboratory or pharmaceutical) the electrical engineer gets enough space (and maintains that space as time goes on) for all the electrical equipment. Sizing electrical rooms only based on the knowns and a little extra is a bad idea. Instead, sizing electrical rooms to allow for multiple additions of panelboards and transformers through design and beyond Day 1 Occupancy not only enables your design to oscillate and flow with the project, but also ensures the client has adequate room for future growth. This is easier said than done, as pharmaceutical space comes at a premium, but electrical engineers must push for it whenever possible. Above all else, communication is key, not only with the client but also with your fellow design professionals. The work of other designers including architects, mechanical engineers, plumbing designers, and fire protection engineers can directly impact the work of the electrical engineer. It is critical that open lines of communication between all team members are maintained for the duration of the project. One’s ability to adapt and react positively to a change is greatly improved if they are an engaged participant throughout design and if they clearly understand the rationale behind the change. In other words: avoid the pitfall of relaying critical information to a fellow designer too late. This will go a long way toward building trust and promoting strong teamwork. For team and project success, it is essential that architects and engineers do not design in a vacuum. Collaborative and integrated design where all team members are communicating with and valuing each other produces a comradery that effectively navigates the challenges of pharmaceutical and biotech projects.